Richmond, California / ACCESSWIRE / May 22, 2014 / Get out your drivers, because golfing pros, politicians, and philanthropists alike are perfecting their swings in preparation for the 8th annual California Autism Foundation Golf Tournament! This exciting tournament is held every year to help support members of the community who have autism lead healthy and fulfilling lives. The golf tournament, which is being held at the new Moraga Country Club, features the theme “Drive Fore Change,” in honor of CAF’s continuing mission to raise awareness of autism within local communities. Proceeds from the tournament will support the foundation’s A Better Chance Camp which provides a summer camp program for children with autism and other similar developmental disabilities. The 8th Annual CAF Golf Tournament will be held on June 23, 2014, starting at 10 AM. With over 96 players already confirmed, potential participants are encouraged to sign up as soon as possible. For those who want to get involved in other ways, there is a potential for 34 sponsorship opportunities. Entry fees are $195 per person, or $740 per foursome. Sponsors and participants can expect to enjoy the finest entertainment, thanks to the Helicopter Golf Ball Drop Opportunity Drawing, which features one thousand balls dropped onto the course via helicopter. Each ball is offered at $10 per ball, with various multiple ball packages also available. The Drop will take place at 3:30pm on June 23rd. Anyone can buy a golf ball, both golfers and non-golfers, without needing to play in the tournament. CAF invites general admission guests to join for the ball drop and cocktail hour post-tournament. 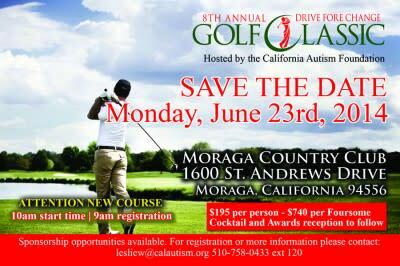 Golf balls can be purchased online at http://www.calautism.org/2014/04/helicopter-ball-drop-opportunity-drawing-for-10000-cash/. “We look forward to seeing everyone get together on June 23rd to support members of the Bay Area Community who have autism,” says Fullard. Moraga Country Club is located at 1600 St. Andrews Drive in Moraga, California. For more information about the 8th Annual CAF Golf Tournament, please contact Leslie Werosh at (510) 758-0433 ext. 120 or at lesliew@calautism.org. The mission of the California Autism Foundation is to provide people with autism and other developmental disabilities the best possible opportunities for lifetime support, training and assistance to help them reach their highest potential for independence, productivity, and fulfillment.